At a Buddhist temple far from home, a curious ceremony provided me solace. I read this article and found it very interesting, thought it might be something for you. The article is called Mizuko Kuyo: Japan’s Powerful Pregnancy Loss Ritual and is located at http://modernloss.com/mizuko-kuyo-japans-powerful-pregnancy-loss-ritual/. In 1999, I terminated a wanted, planned and joyfully anticipated pregnancy due to a birth defect discovered during my 16-week ultrasound. This decision took a far greater emotional toll on me than I could have imagined. I spent weeks in a state of profound confusion. How could this have happened? The sight of pregnant women — staggering under the weight of their unborn babies, flushed and radiant with life — caused me the most intense, painful yearning, and I could not control the tears that often resulted. A few days after I came home from the hospital, a group of women friends who knew what I’d just gone through came to my house. They brought flowers and food, and as we sat in my living room, they shared their stories with me. It turned out that each one of them had experienced a pregnancy loss or the death of an infant. As a result, we all had unresolved emotions. Yet none of us knew of a ritual to help us through this very specific grieving process. A few years later, I read an article about a Buddhist practice called mizuko kuyo, a memorial service for anyone who experienced pregnancy loss, stillbirth or perinatal loss. I discovered a Buddhist temple in a town about two hours’ drive from my home that conducted these ceremonies once per month. Curious, I contacted the temple and made arrangements to attend. On a sunny April day, I arrived late to the temple and spent a few minutes wandering around the garden looking for the building where the ritual was to be performed. At the back of the temple, I found a bamboo fence covered in small, handmade objects. Most of them were bags made of red cloth, fluttering in the breeze. Near the fence I noticed statues of various sizes with bits of cloth tied to them. When I found the small wooden house where the ritual was taking place, the leader, a Soto Zen priest who had herself experienced pregnancy loss, directed me to an altar that held statues of Buddha, Mary and Jesus, and Jizo. 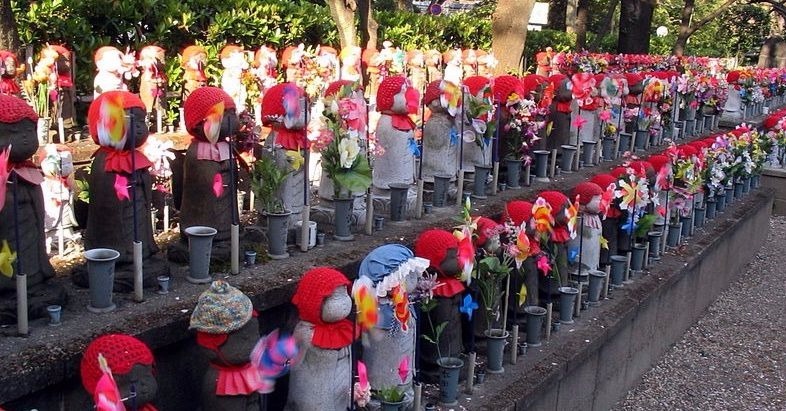 Jizo is the Buddhist deity who has become the protector of aborted, miscarried and stillborn children, as well as those who died shortly after birth. The priest asked me to choose one of these “figures of compassion” for the ritual. I chose Mary holding baby Jesus. I sat down with the other people there – a young woman and a middle-aged couple – and began making a little pouch from some red cloth. No one spoke. After about 45 minutes, the priest rose and rang the bell, beginning the ceremony. She then stated its purpose: “To honor children born and unborn.” We brought the bags we’d made to the statue we had chosen. I draped my pouch around the Mary and Jesus statue. Then we each lit a stick of incense and placed it in a box filled with sand. The priest said, “Gone, gone, gone!” in a loud voice. That was all. The ceremony was over. The priest told us that the offerings would be left in the prayer room for one month, and then hung on the bamboo fence at the back of the garden. We left in silence. Later I spoke with the priest about the ritual. For a long time, due to a lack of reliable birth control, it was not uncommon for a Japanese woman to have had as many as seven or eight abortions during her life. (The birth control pill was not legal in Japan until 1999, the year I lost my baby; abortion has been legal there since 1949.) The priest told me that Japanese women had asked Buddhist priests to create a ritual that addressed the grief they experienced from having had so many abortions. Mizuko kuyo — a “fetus memorial service,” common beginning in 1970s Japan — is the result. The priest told me that in some Buddhist temples, the ritual had become quite coercive, with priests frightening women into making large financial donations to prevent retribution from the angry spirits of their dead children. To counter that, this priest conducted her rituals in an atmosphere of compassion, respecting the anonymity of the participants and accepting no money. She believed strongly in the Buddhist “middle way,” one that shows compassion for both the mother and the fetus. We commented on the irony of the fact that on that same day, April 25, 2004, thousands of women were in Washington D.C. at the March for Women’s Lives, demonstrating both for and against abortion rights. “For and against” were words, the priest told me, that had brought too much pain to too many people. I thanked her for her time, and after exploring the garden, I headed home. After five years of unresolved emotions about having terminated a wanted pregnancy, I felt healing begin. I thought about the figure of Mary holding the baby Jesus, and decided that she was the protector of my unborn baby’s spirit. The image comforted me, and I return to it often. Mostly I am grateful that such a ritual exists, and that I was able to participate. Erica Goss served as Poet Laureate of Los Gatos, California, from 2013-2016. She is the author of “Night Court,” winner of the 2016 Lyrebird Award, “Wild Place” and “Vibrant Words: Ideas and Inspirations for Poets.” She is co-founder of Media Poetry Studio, a poetry-and-film camp for teen girls.